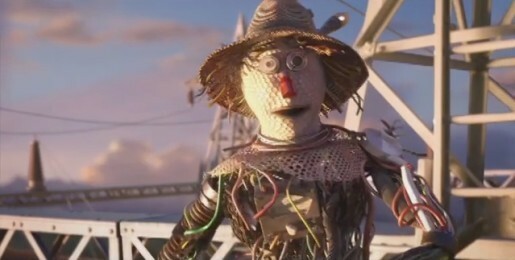 General Electric uses a Wizard of Oz reference to promote Smart Grid technology in “Scarecrow”, a commercial launched at the Super Bowl 2009. A scarecrow sings the Wizard of Oz song, “If Only I Had a Brain”, swinging through the pylons and interacting with a crow and a dog. The commercial presents a vision for a more efficient, sustainable electrical energy grid, simply by making it more intelligent. The GE Scarecrow spot was developed at BBDO New York by chief creative officers David Lubars and Bill Bruce, executive creative director Don Schneider, senior creative director/art director Ted Shaine, senior creative director/copywriter Tom Darbyshire, director of TV production Regina Ebel, assistant producer Regina Iannuzzi, director of music Rani Vaz. Filming was shot by production collective Traktor. Editor was Sherri Margulies at Crew Cuts. Animation and VFX were developed at Framestore New York, with senior producer/head of production Laney Gradus. Music was the responsibility of DHMA.